pKLAC1-GLuc is a yeast reporter plasmid that can be used with the K. lactis Expression Kit (NEB #E1000). The backbone integrative expression vector, pKLAC1, directs high-level secretion of Gaussia priniceps luciferase (GLuc) from the yeast Kluyveromyces lactis. The gene encoding GLuc is cloned in the NotI-StuI sites of pKLAC1, in-frame with the a-factor secretion leader domain. pKLAC1-GLuc can be used to test plasmid transformation, cell culture, and protein production procedures. Additionally, GLuc can be used as a carboxy-terminal fusion tag on a desired protein to track its secretion. GLuc activity is easily detected in K. lactis spent culture medium (Figure 1) using the Gaussia Luciferase Assay Kit (NEB #E3300). Figure 1. Detection of a secreted malE-Gluc fusion protein in spent culture medium. Medium (25 µl) from wild-type GG799 cells (lane 1) and GG799 cells contaning integrated pKLAC1-malE-Gluc was assyed using the Gaussia Luciferase Assay Kit (NEB #E3300S ). Expression of the fusion gene is under the control of the strong K. lactis PLAC4-PBI promoter. 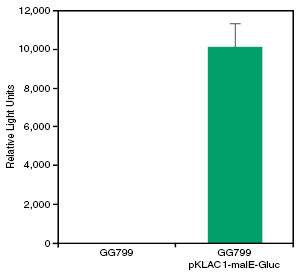 K. lactis strain GG799 can be used as an expression host. Gaussia luciferase generates over 1000-fold higher bioluminescent signal intensity, compared to Firefly and Renilla luciferases. The secreted luciferase protein is very stable and can be stored for several days at 4°C without loss of activity. NEB 5-alpha Competent E. coli (High Efficiency) (NEB #C2987), NEB 5-alpha Electrocompetent E. coli (NEB #C2989) and NEB 5-alpha Competent E. coli (Subcloning Efficiency) (NEB #C2988) are all recommended for propagation of this control plasmid. Notice to Buyer/User: The vector pKLAC1-Gluc is a component of an expression system that was developed from basic research at New England Biolabs, Inc. and DSM Biologics Company B.V. The buyer/user has a non-exclusive sublicense to use this system or any component thereof, including vector pKLAC1-Gluc, for RESEARCH PURPOSES ONLY. A license to use this system for manufacture of clinical grade material or commercial purposes is available from New England Biolabs, Inc., or DSM Biologics Company B.V.
Non-Commercial Entities: This product is covered by US Patent 6,232,107 and other patents that are legal property as assigned to Prolume Ltd./Nanolight Technologies. This product is licensed only to the purchasing laboratory-research group. Recipient agrees not to transfer this plasmid or derivatives of this vector to any other laboratory, person or research group, even if within the same institution. Recipient agrees not to alter or make any changes to the nucleotide coding sequence or secretory coding sequence of the luciferase(s) contained within without prior written permission from Prolume Ltd./Nanolight Technologies (www.nanolight.com). Recipient agrees not to file for any patent rights or to any inventions claiming any portion of the luciferase(s) within this material without prior written permission from Prolume Ltd./Nanolight Technologies. Commercial For-Profit Entities & Non-Profit Foundations (herein referred to as Commercial Recipients): Commercial Recipients wishing to derive products, engage in the sale or license of any products, discover drugs or make inventions by use of the materials enclosed, fully agree to the terms mentioned above for Non-Commercial Entities; AND ADDITIONALLY agree to and are hereby bound to use the materials FOR EVALUATION PURPOSES ONLY. Commercial Recipient hereby agrees to destroy and cease use of any materials or derivatives containing any portion of these materials within 120 days from receipt. Commercial Recipient agrees not to use the materials for any use, other than the 120 day suitability evaluation without prior written permission or obtaining a valid license from Prolume Ltd./ Nanolight Technologies.